yoga flow, mindful breathing, guided relaxation and meditation. Open up your legs, hips, lower back, shoulders and arms helping you to feel relaxed, cleansed and refreshed from the inside out. After time on the mat, set your life on a positive path through affirmation and goal writing exercises. -Clear away layers of accumulated toxins in your life..
-Guide your mind and body into a mini urban-retreat. -Cleanse your entire being and make space to write down and manifest your goals. -All levels of yoga welcome. Bring a journal, pen, your yoga mat, light weight scarf, towel and blocks if needed. Enjoying a day trip Rockaways, it is a wonderful way to savor the end of Summer bliss and it is only a ferry or subway ride away on the A train! 9:30-12 PM Yoga, Breathing, Relaxation & Meditation class with Ruah guiding you to strengthen, open and relax your body, mind and spirit. This class will leave you feeling invigorated, and refreshed - ready to hop on your board and hang ten! Enjoy a beautiful stroll on the board walk after class and off the beach a few blocks to one of the best tacos on the East Coast at Rockaway Taco http://rockawaytaco.com! These tacos meet even the standards of my West Coast family/taco connoisseurs! Chill out on the beach for the rest of the day or visit Caracas Arepa Bar and take in the beautiful view while sipping margarita or savoring delicious ice cream (or more yummy Venezuelan food) from the boardwalk at Caracas http://www.caracasarepabar.com/rockaway.php. Learn to Surf with the fantastic Locals Surf School http://localssurfschool.com/. These are the same great teachers that taught me my first surf lesson! You will feel safe, prepared and ready to the most out of your surfing experience. If you are interested, reach out to them directly by visiting their website or finding them on Facebook and reach out to them for availability. Rockaway Beach is accessible by car, train, bus or bike. The beach is about an hour from downtown Brooklyn on the A train ride away from downtown Manhattan and . Check out google maps or Hop Stop to see for yourself. If you are a biker, it's an accessible 10 mile ride from- a great way to start the day! We'll meet on the beach in front of Caracas Areba Bar. 1) Take DOWNTOWN Bkyln/Qns A-Train towards FAR ROCKAWAY (there are other A train destinations, so make sure you get on the FAR ROCKAWAY one) to BROAD CHANNEL. 2) Get off at BROAD CHANNEL to Transfer to the S to 106th St.
3) Get off at Beach 106th St. and walk to Beach 105th street and turn right towards the beach. 4) Once at the beach, turn right again until you arrive at Caracas Arepa Bar. 5) Look for me and the other yogis on the beach. 1) LIRR towards Far Rockaway, and get off the train at Far Rockaway-Mott Avenue. 2) TRANSFER to the Manhattan Bound A-train. Then you will arrive at your destination, which is the beach 67th St stop (5 stops). 2) Once at the beach, turn right again until you arrive at Caracas Arepa Bar. 3) Look for me and the other yogis on the beach. v Yoga Gear – bring whatever you feel like doing yoga in and maybe a bandana or hat to cover your head from the sun. v Towel, sheet or Yoga Mat to practice on. v Healthy snacks like fruit, nuts and protein bars. *Release stress, rejuvenate your mind, refresh your body and awaken your spirit. *Emerge with an overall sense of energy and clarity. 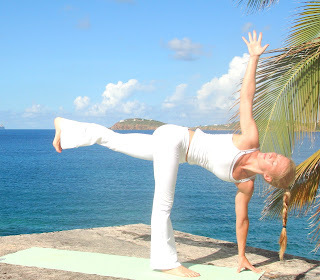 * Spend the day doing yoga, pranayama, relaxation and meditation. Open to all levels of yoga and meditation practices. Bring layers of clothing and a lightweight scarf for meditation. - thick towel, yoga blanket or meditation cushion to sit comfortably on. FULL BODY PRACTICE: Get Sweaty. Be Inspired. * Full body, sweaty, flowing, challenging yet accessible yoga practice with mindful offerings of both modifications using props and variations including arm balances set to great music. *Inspiring dharma lesson on how to integrate a specific yoga philosophy on the mat and in experiences of everyday life. *Hands on assists and “svasana massage” using Ruah’s homemade RuahVeda organic essential oil blend based on the Ayurvedic Dosha season (with the option to pass on any or all of this). 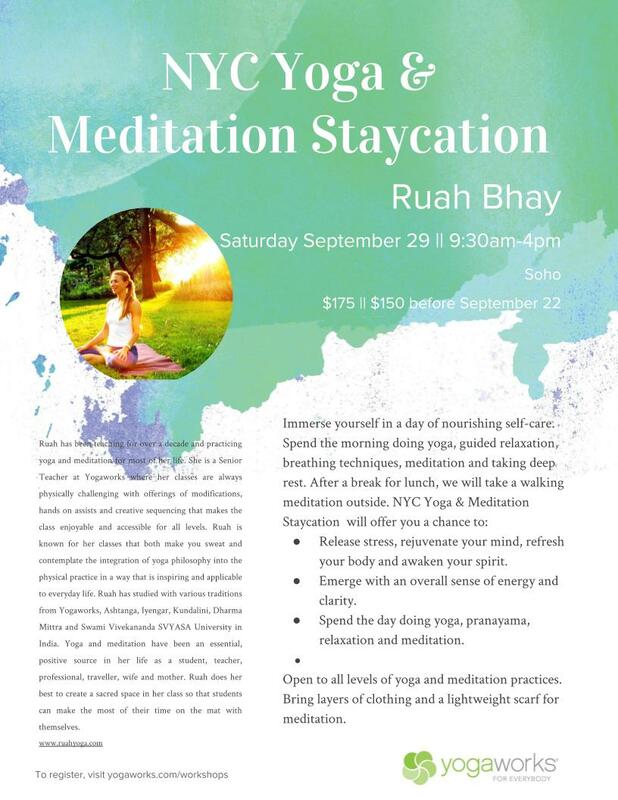 This workshop will leave your body, mind and spirit feeling cleansed, free and inspired! Broaden your knowledge and improve your ability to give mindful, confident, safe and delicious hands on assists. Deepen your understanding of the poses and use this as a time and space to have a better understanding of the physical asana practice. Learn and/or fine-tune when and how to effectively assist a variety yoga postures of all levels. Experience assists yourself during a full body 1.5 hour practice. Receive feedback on your assists. Discuss best practices and challenges of assisting students using hands, words and body language. The workshop is meant for teachers but also open to aspiring teachers and intermediate yogis. *Learn the fundamentals of an inversion practice and how to apply them to your body. *Receive personal attention and feedback on your inversion practice. *Discover helpful modifications or advanced variations right for your body and practice. Come and find your "aha" moment! 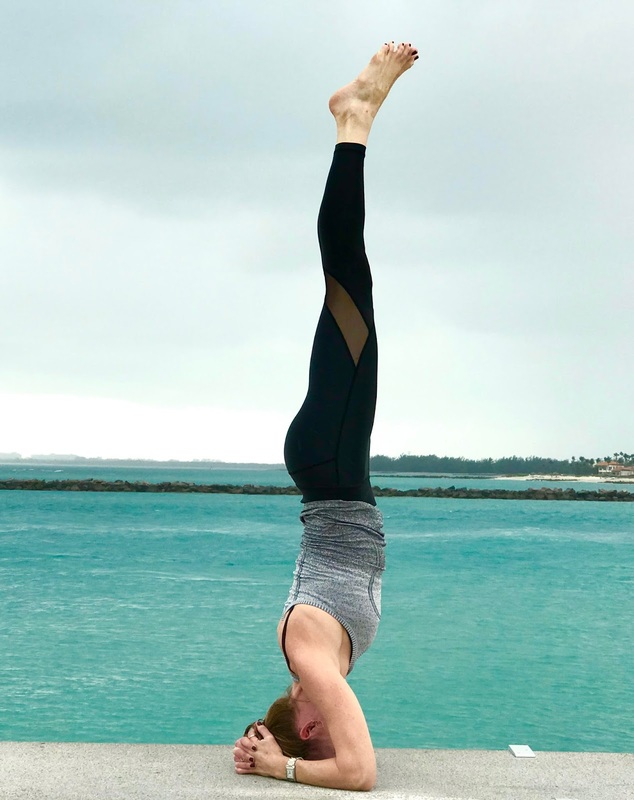 Whether you hope to learn how to go upside down at all or are looking to take your inversion practice to the next level, this workshop is for you!